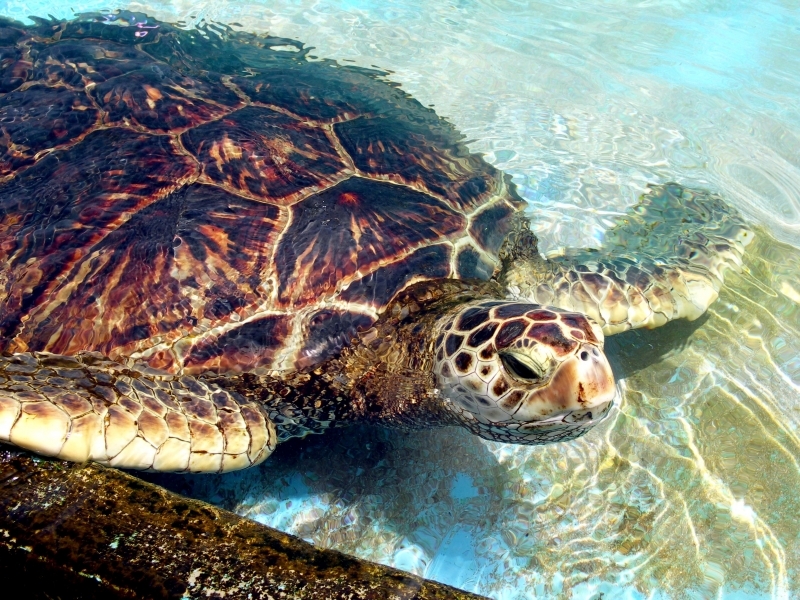 Green Sea Turtles are Chelonians, which means they have 4 legs and a tough shell made of 2 parts which join at the sides. 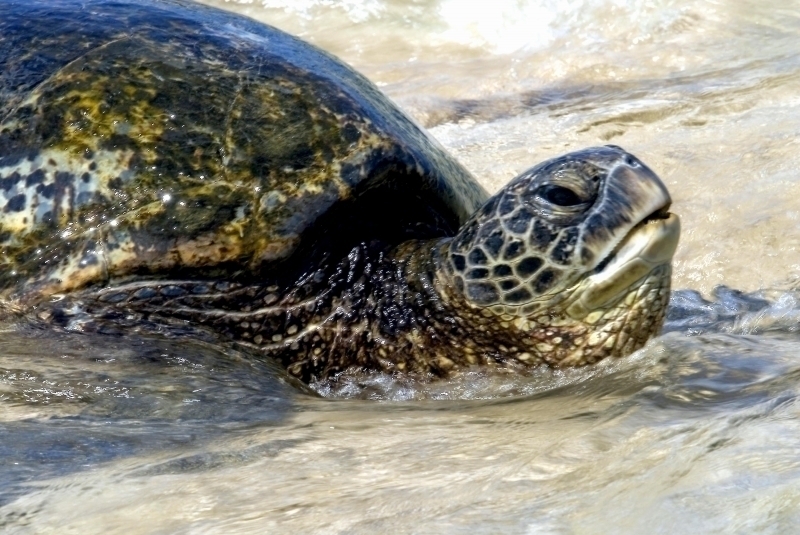 Chelonians also have strong horny mouths or beaks with no teeth. 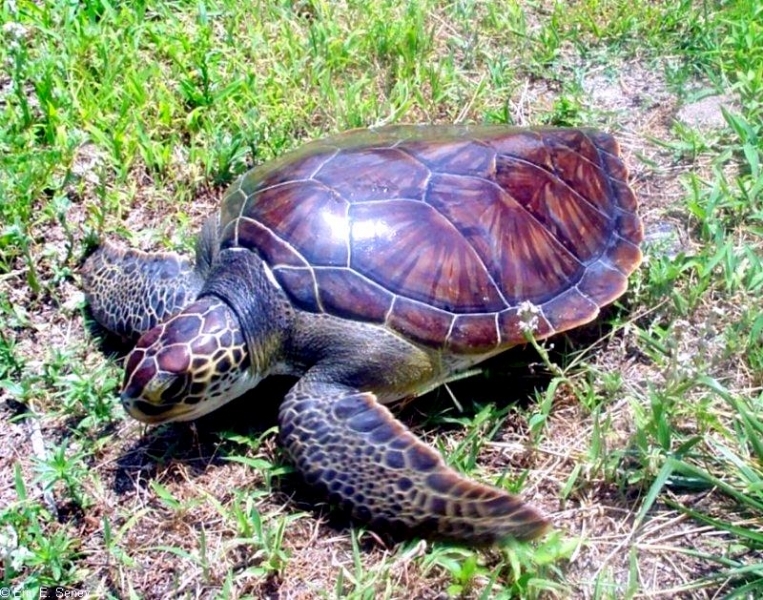 There are 3 types of Chelonians, Tortoises that live on land, Terrapins that live in freshwater and Marine Turtles that live in saltwater. 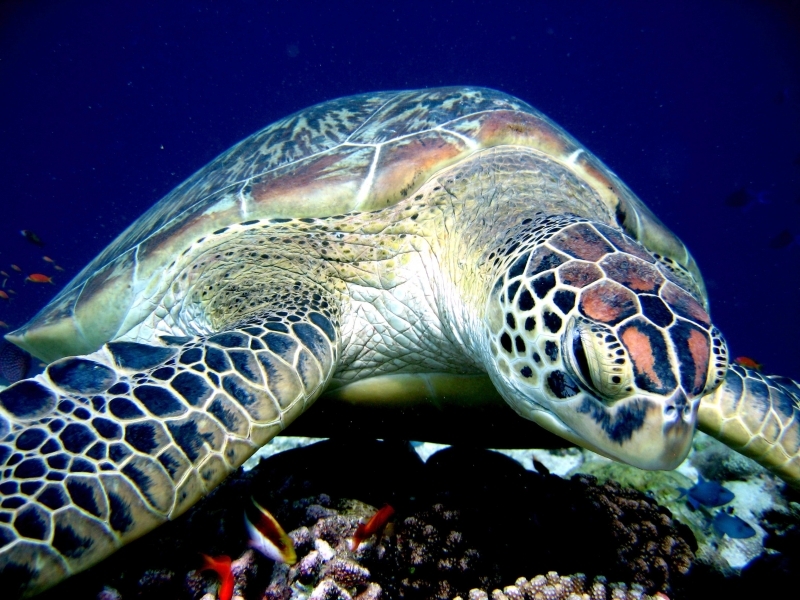 The Green Sea Turtle gets its name from the green-colored fat tissue under its shell. 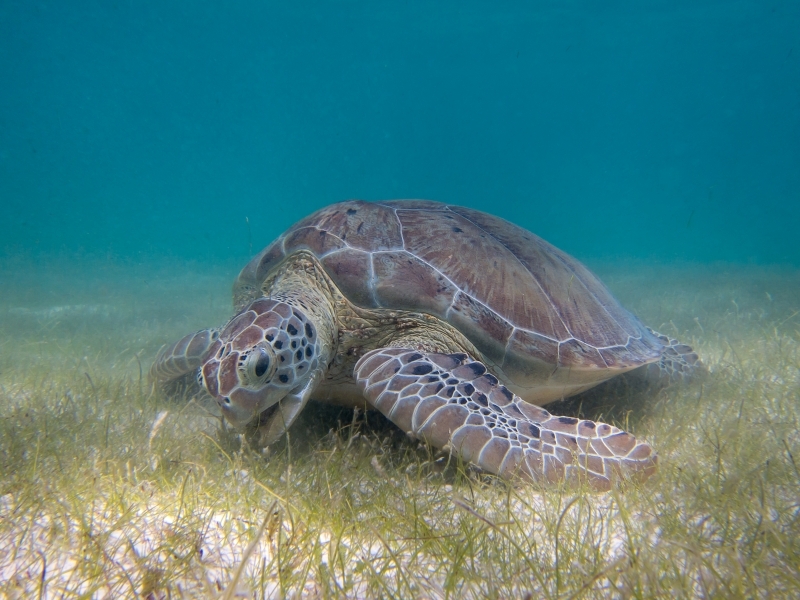 The fat has a green color because the adult turtle’s diet consists of sea grass & algae. 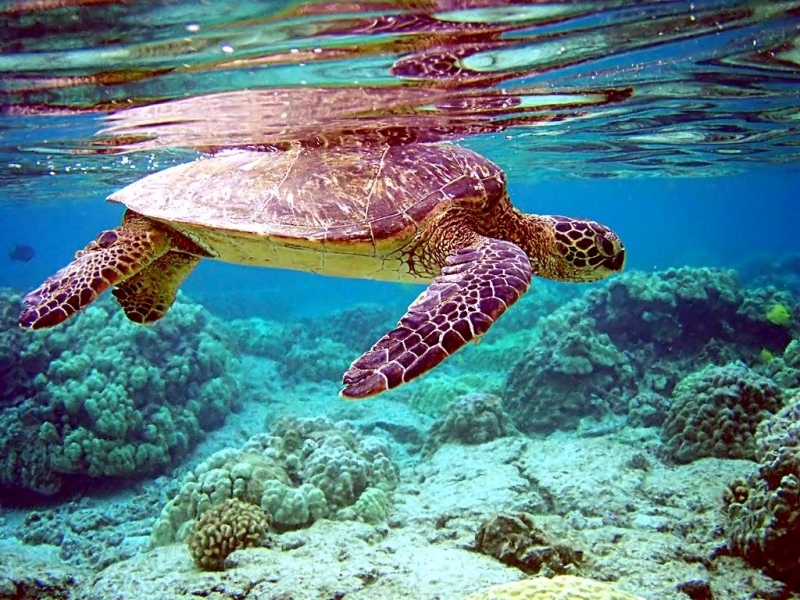 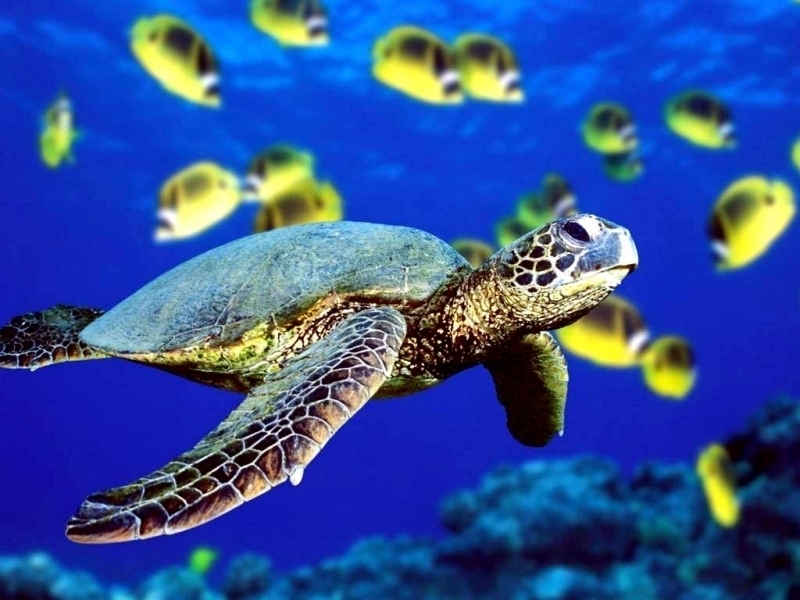 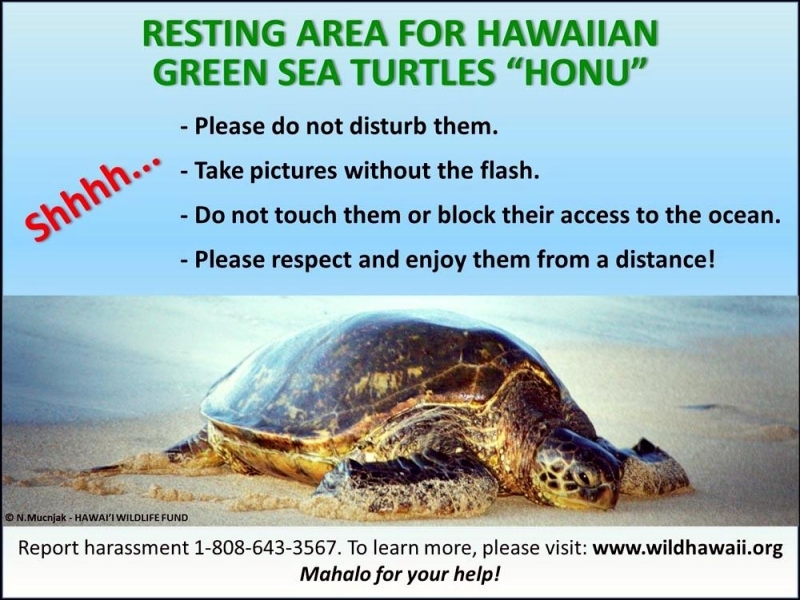 The Hawaiian name for the Green Sea Turtle is Honu. 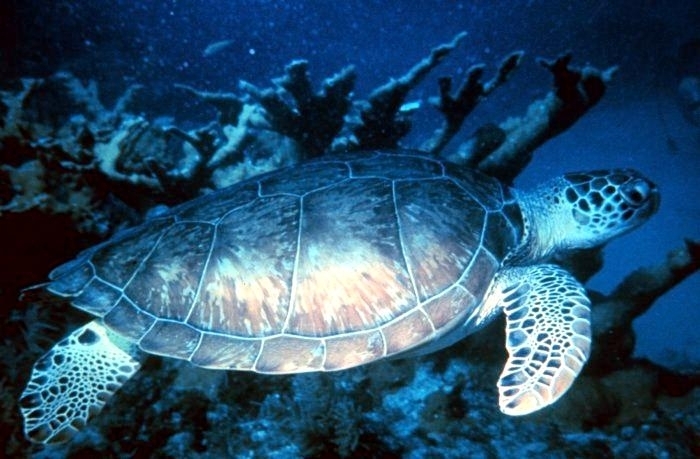 The Green Sea Turtle‘s legs are shaped like flippers. 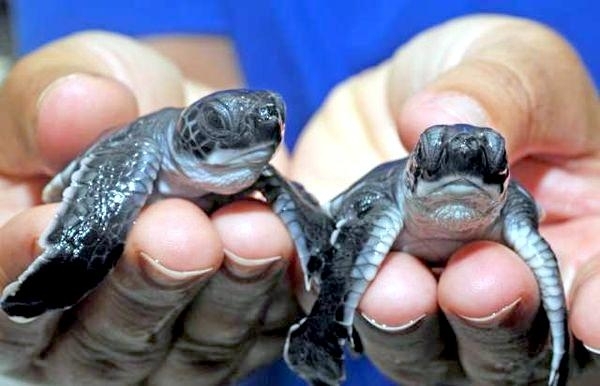 Their heads are lizard-like, with a hooked beak and toothless jaw. 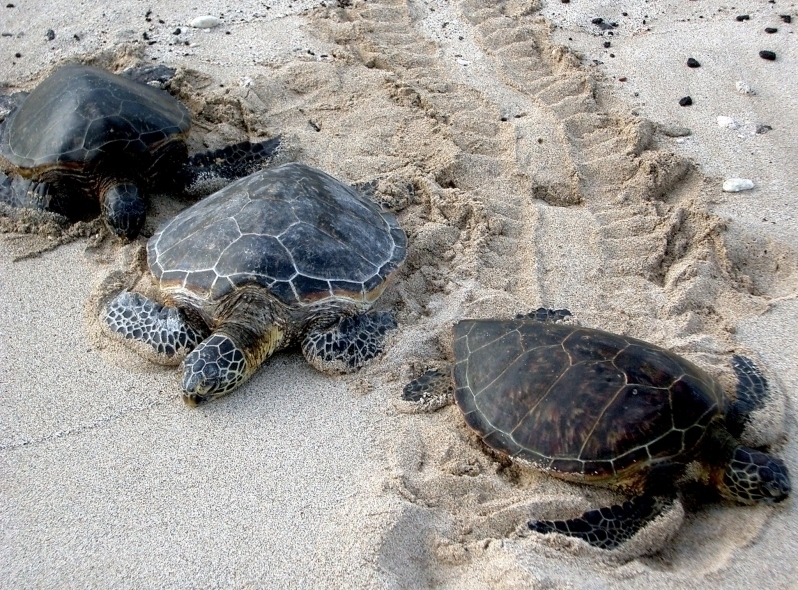 Adult Green Sea Turtles may grow up to 99 centimeters long and weigh 180 kilograms. 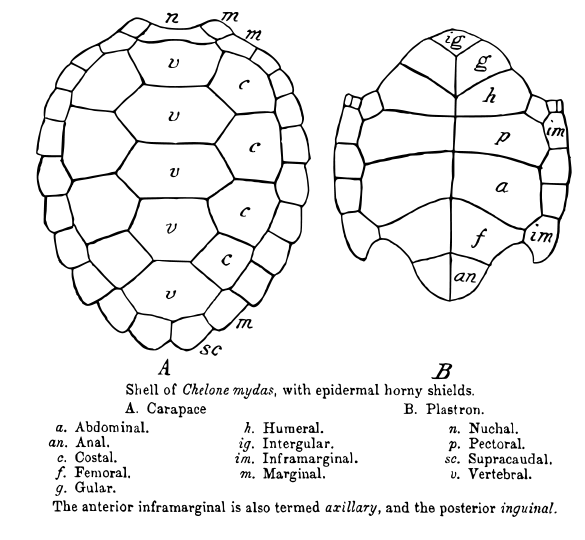 The top half of their shell is called the carapace. 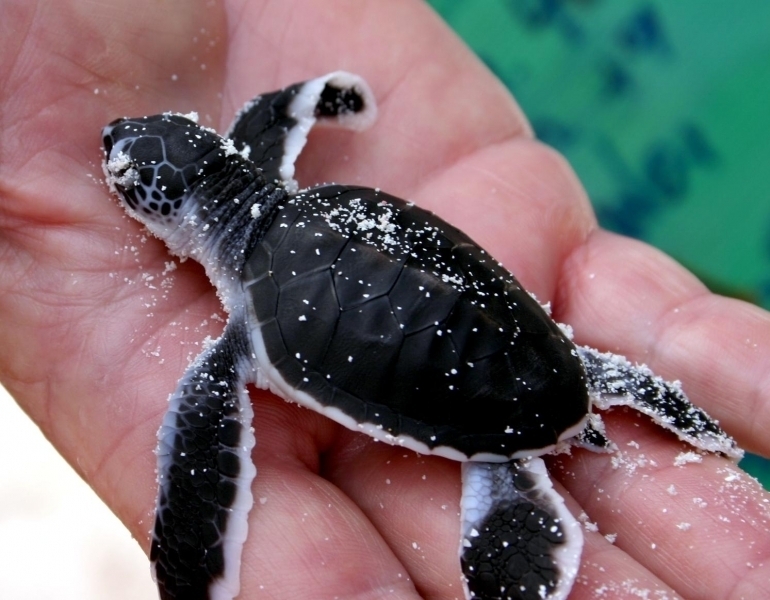 It feels smooth and is gray, green, brown and/or black. 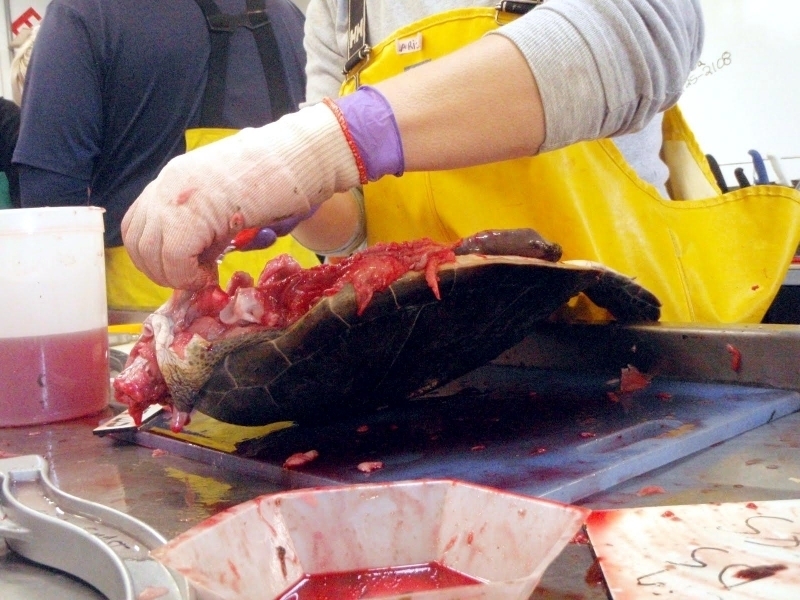 It’s tougher than the under shell, which is called the plastron and is yellowish white. 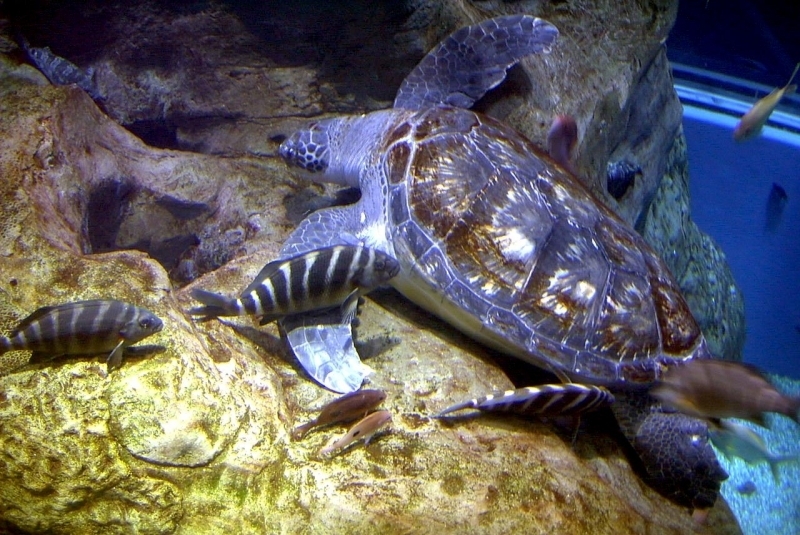 Males have a larger tail than females, slightly longer, narrower carapaces than females and enlarged curved claws on the front flippers for gripping the female when mating. 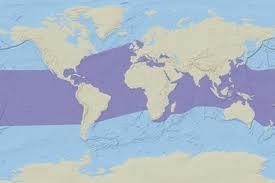 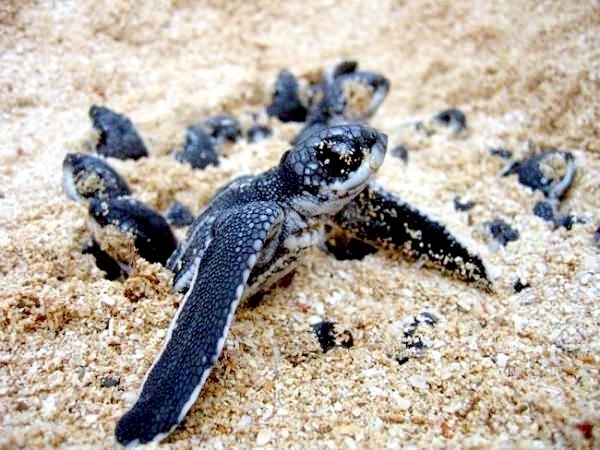 The population found in the eastern Pacific is often called the Black Sea Turtle and is sometimes described as a separate species. 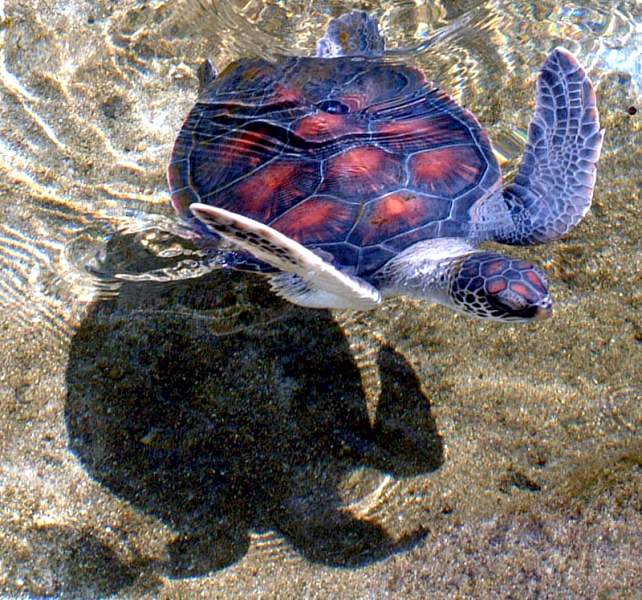 Individuals from the East Pacific are smaller than their counterparts in the Western Caribbean in a wide range of external measurements and are particularly dark in color, a trait that has shown to be genetically influenced. 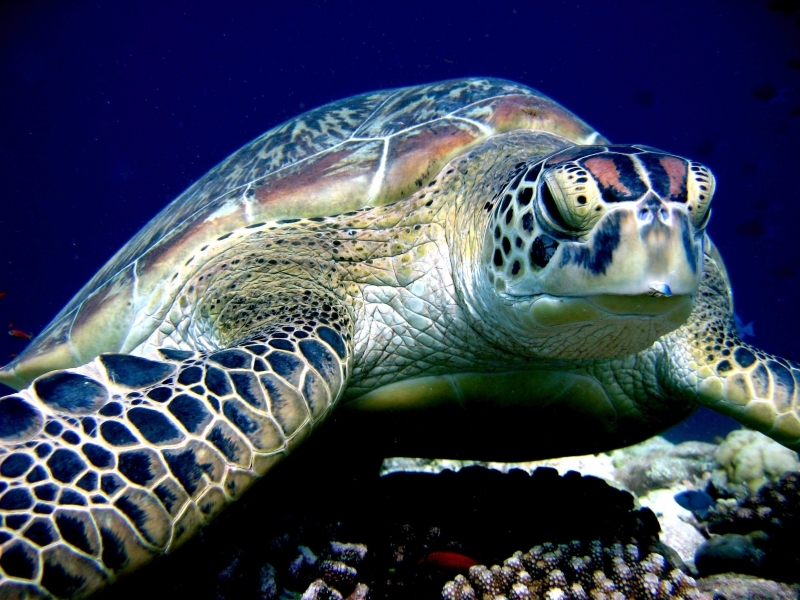 Green Sea Turtles can rest or sleep underwater for several hours at a time but submergence time is much shorter while diving for food or to escape predators. 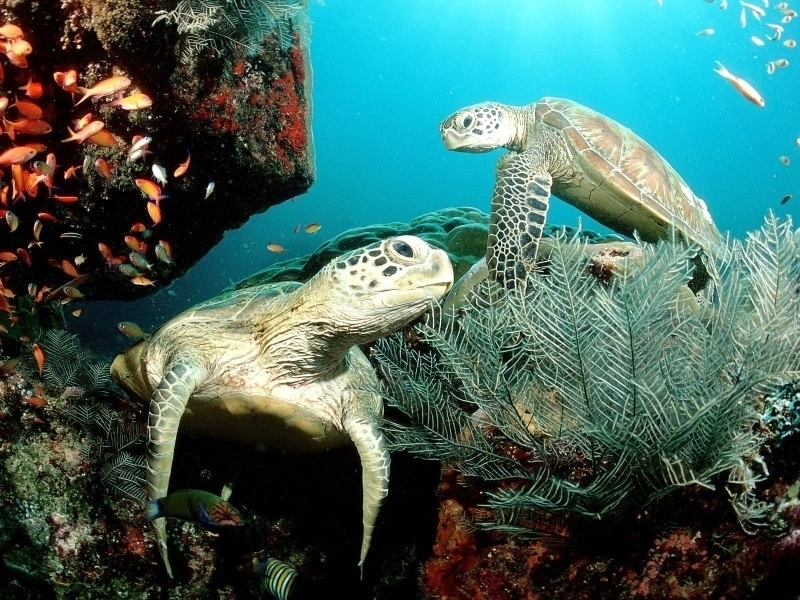 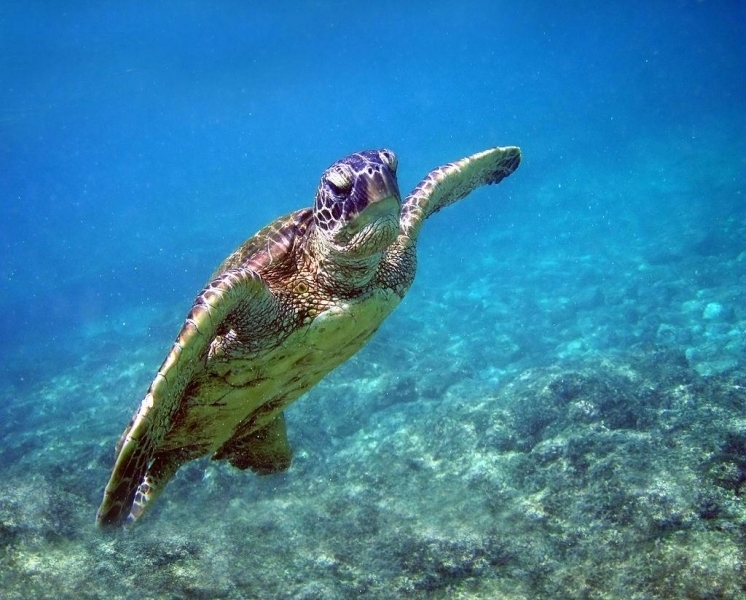 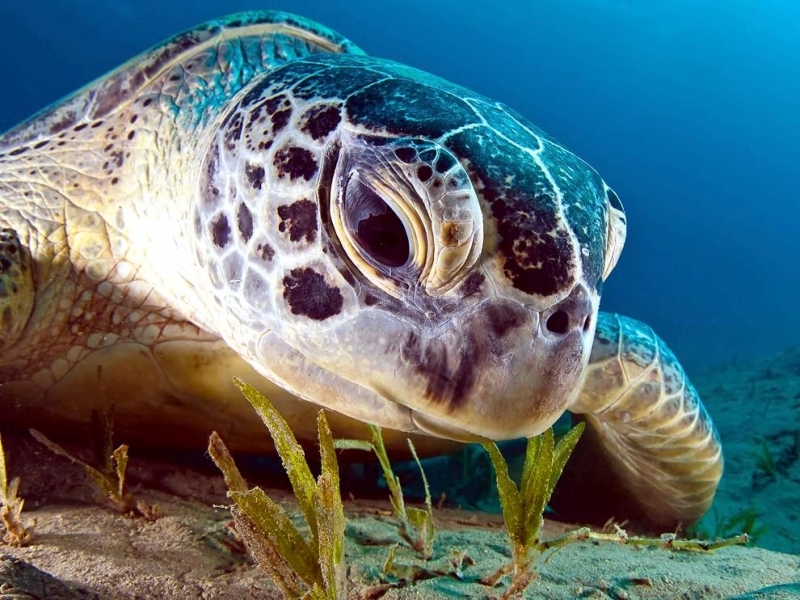 Breath-holding ability is affected by activity and stress, which is why sea turtles drown in shrimp trawls and other fishing gear within a relatively short time. 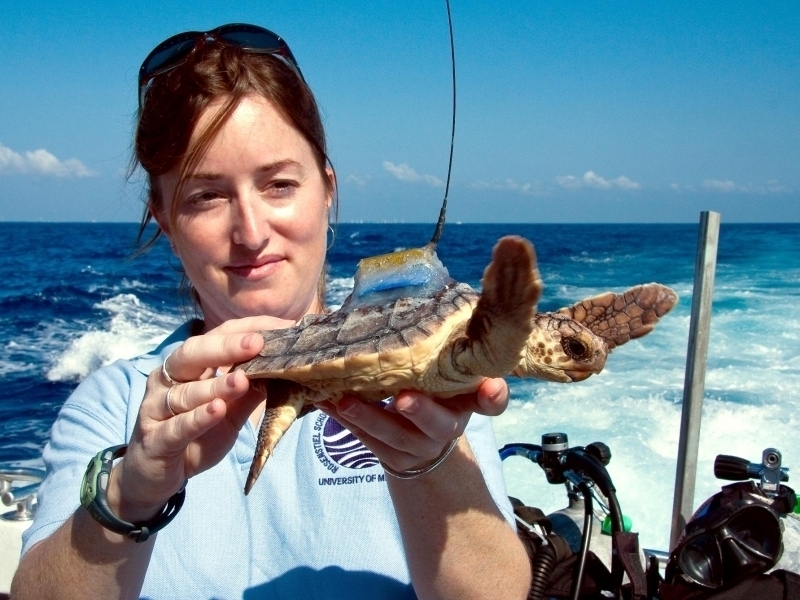 Because Green Sea Turtles are difficult to study in the open ocean, scientists are just beginning to learn about the life history of sea turtles. 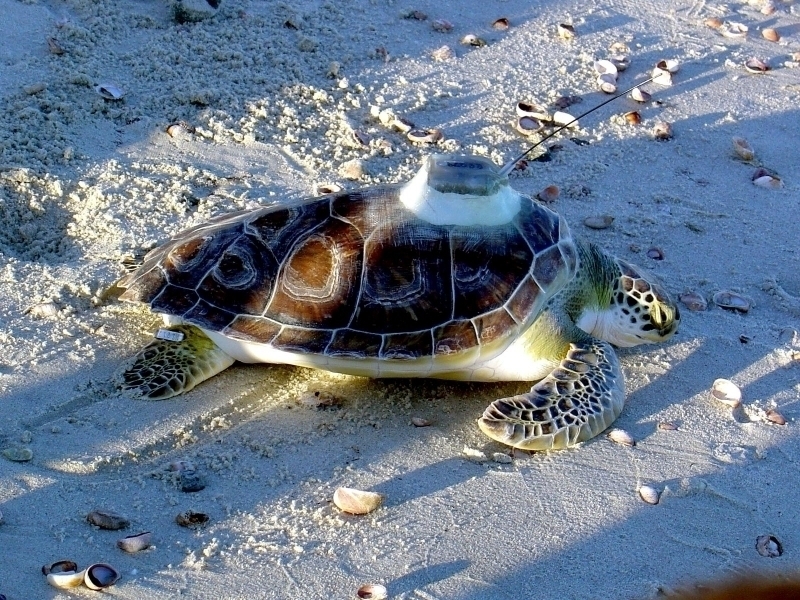 Today, radio transmitters attached to nesting turtles help track the sea creatures on their travels and provide valuable information. 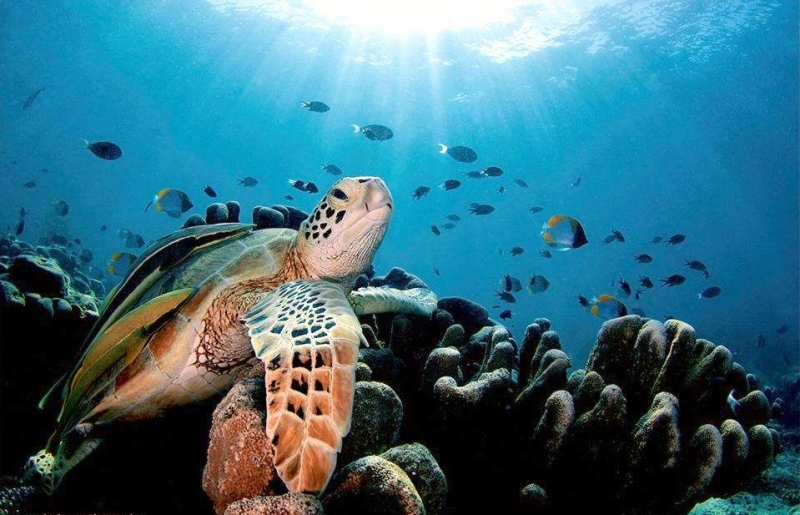 Green Sea Turtles are found in the Pacific, Atlantic and Indian Oceans and worldwide in seas where temperature does not fall below 20 °C. 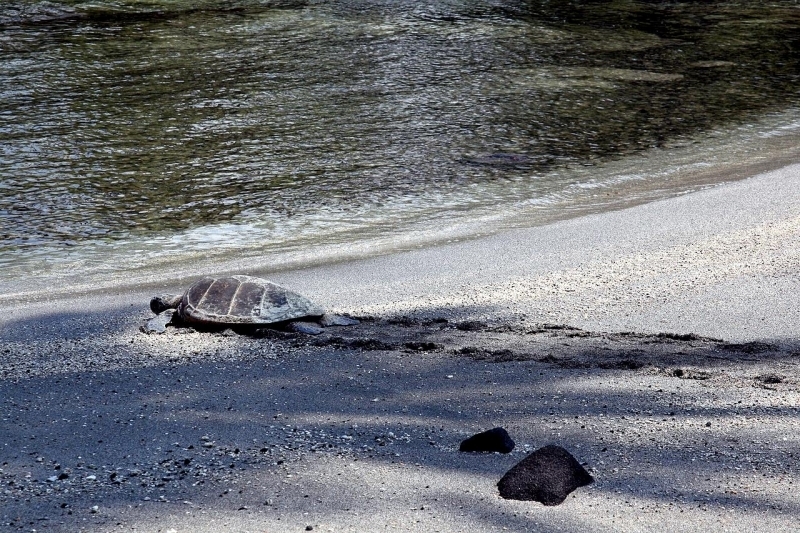 Males never leave the water, but females swim to the shore to lay their eggs. 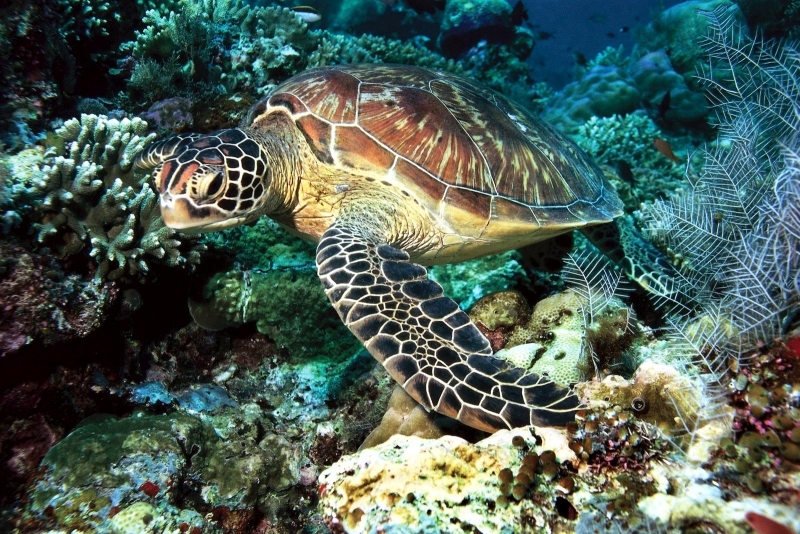 Green Sea Turtles eat seaweed and algae, but they also eat sea creatures like sea jellies, crayfish and crabs. 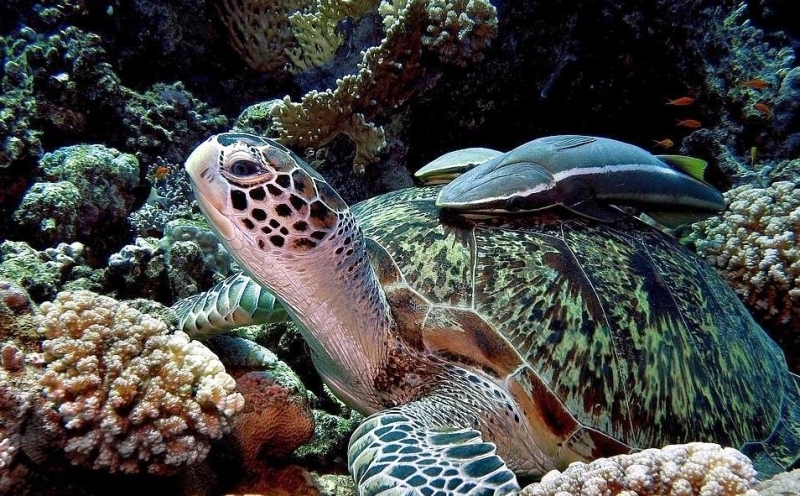 Green Sea Turtles are some of the largest turtles in the world and live in almost every ocean of the world. 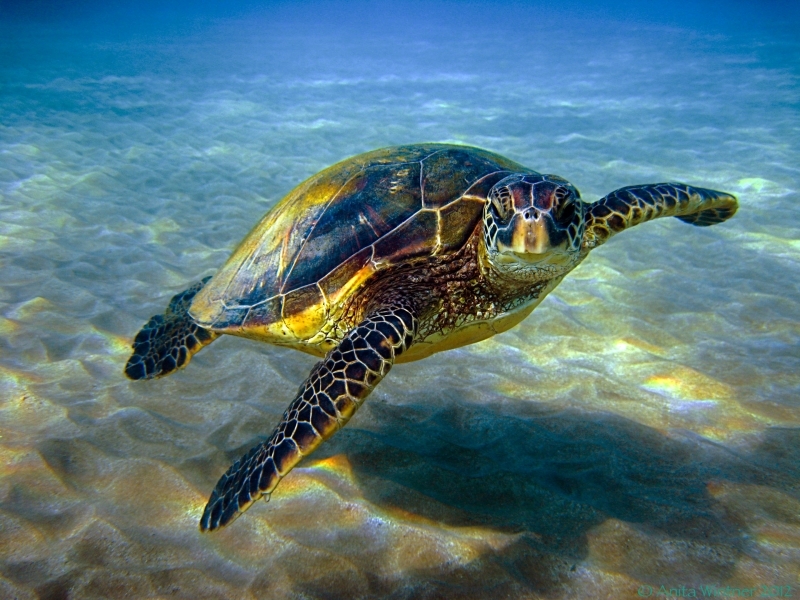 Their smooth shells and paddle-like flippers help them speed through the water as fast as 24 kph. 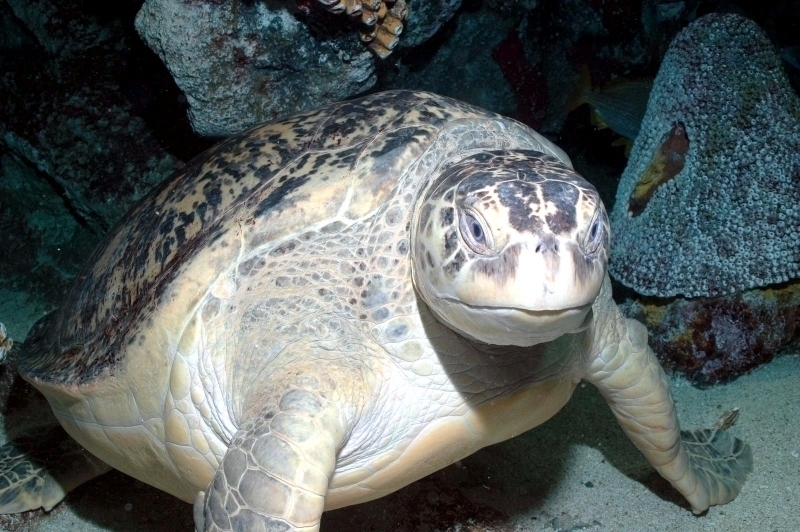 These long distance travelers have been known to swim up to 4,428 kilometers. 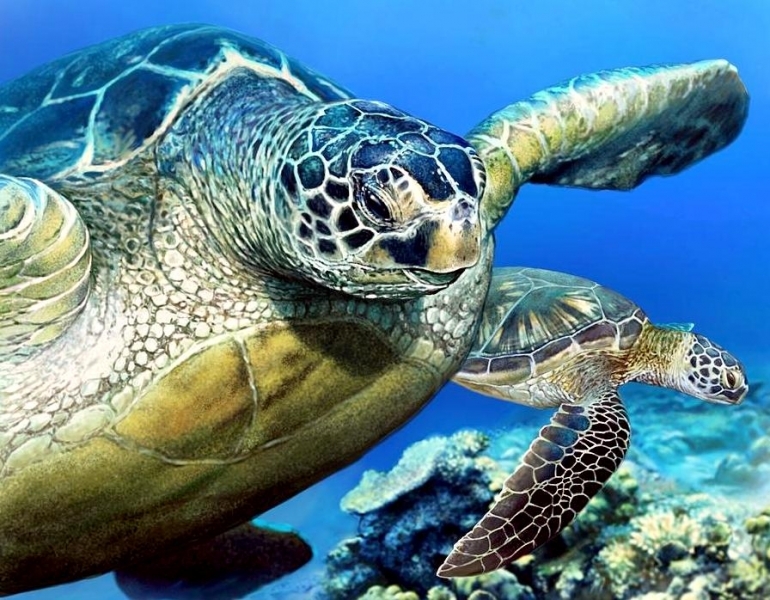 Although Green Sea Turtles cannot withdraw their heads into their shells, the adults are protected from predators by their shells, large size and thick scaly skin on their heads and necks. 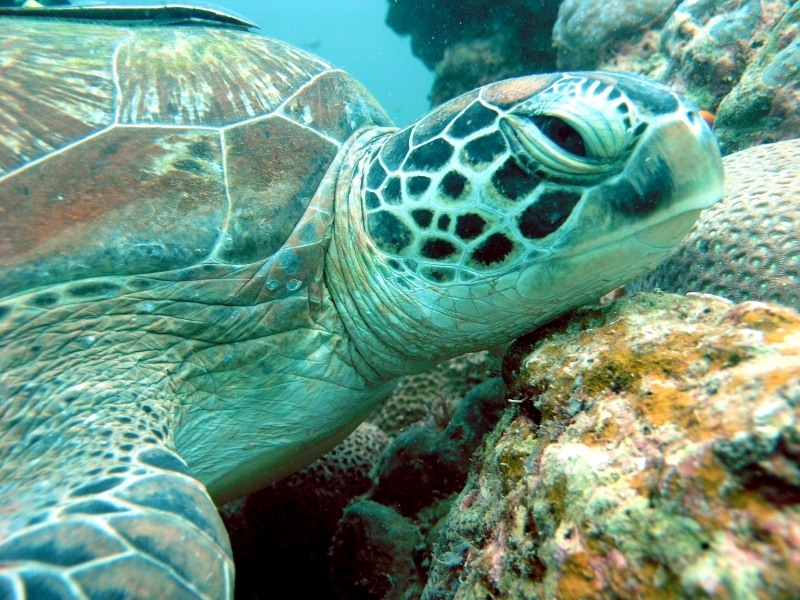 Green Sea Turtles spend almost all their lives submerged but must breathe air for the oxygen needed to meet the demands of vigorous activity. 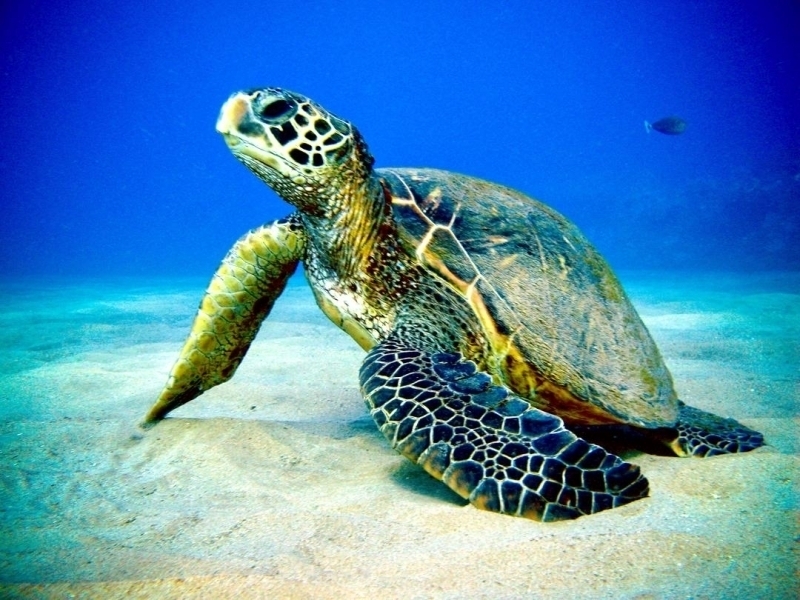 With a single explosive exhalation and rapid inhalation, sea turtles can quickly replace the air in their lungs. 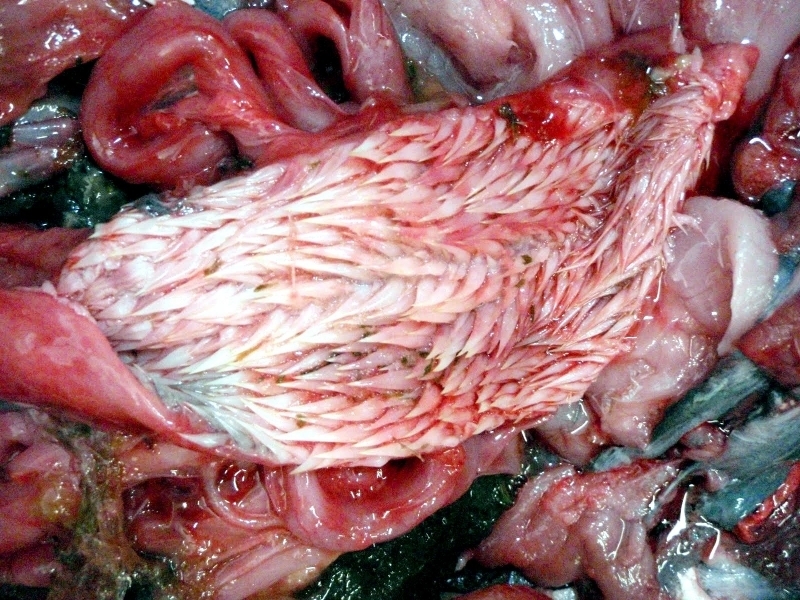 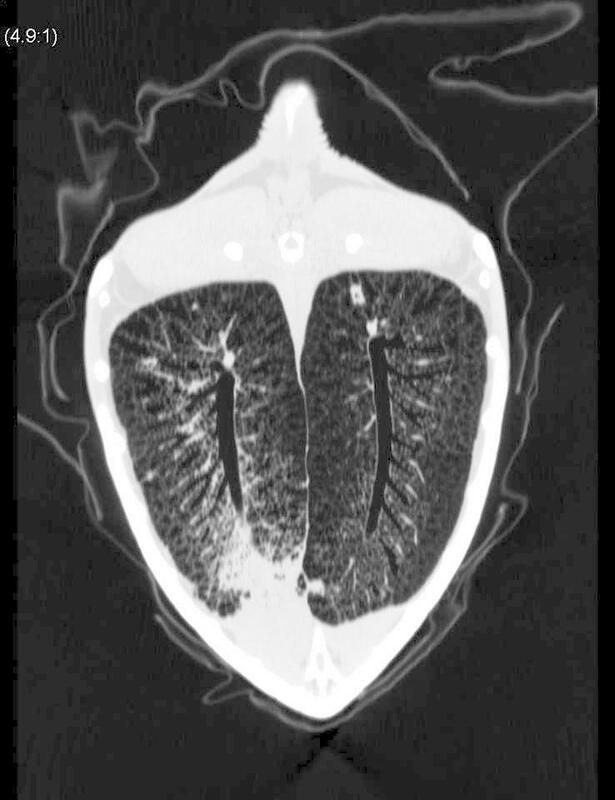 The lungs are adapted to permit a rapid exchange of oxygen and to prevent gasses from being trapped during deep dives. 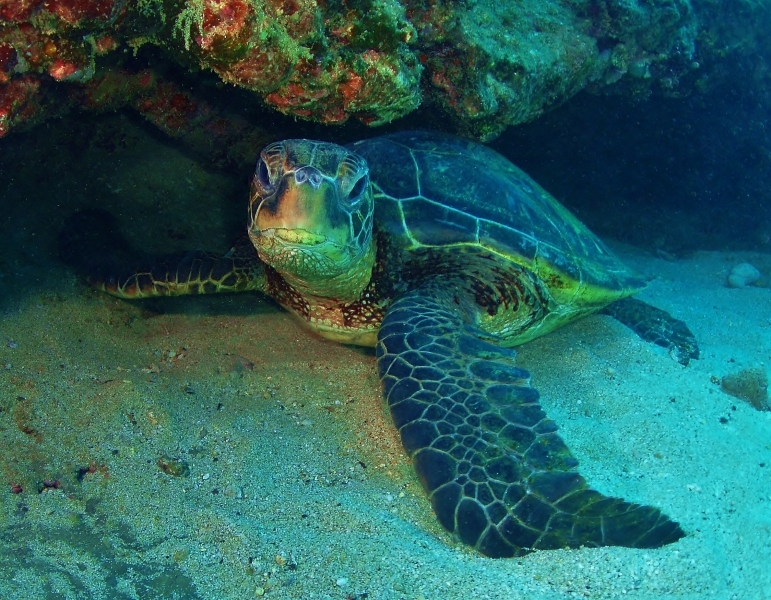 The blood of Green Sea Turtles can deliver oxygen efficiently to body tissues even at the pressures encountered during diving. 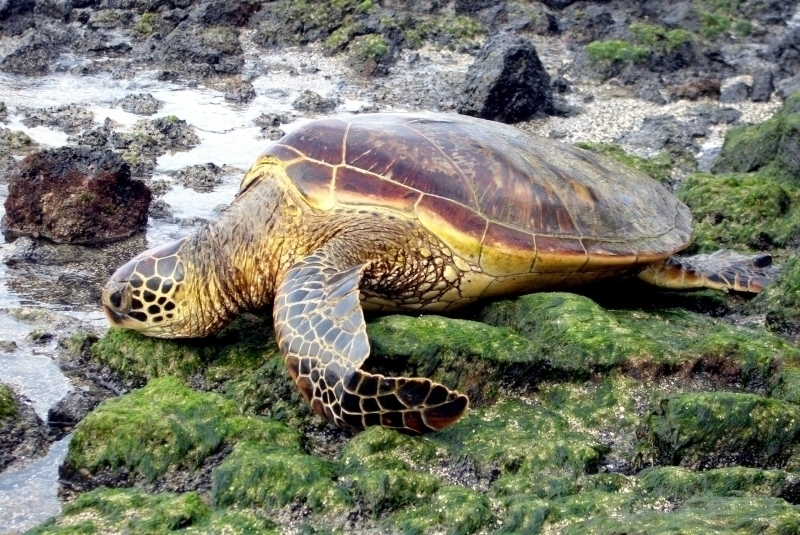 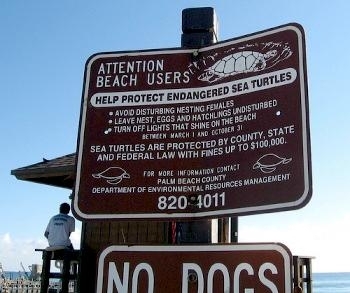 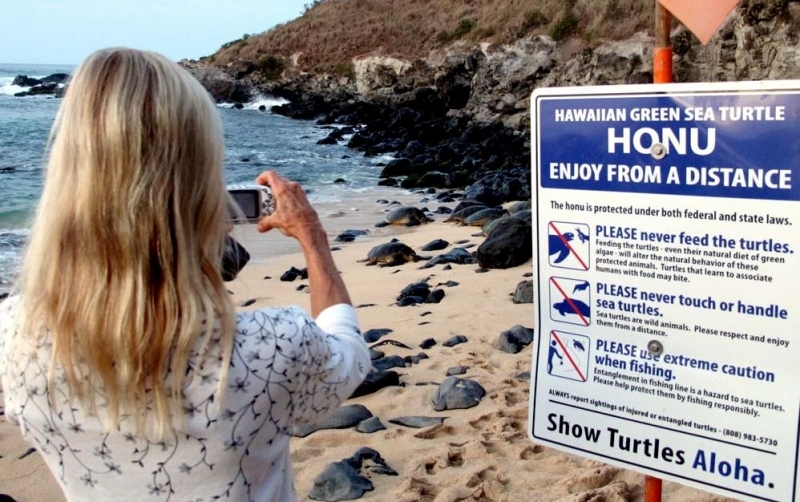 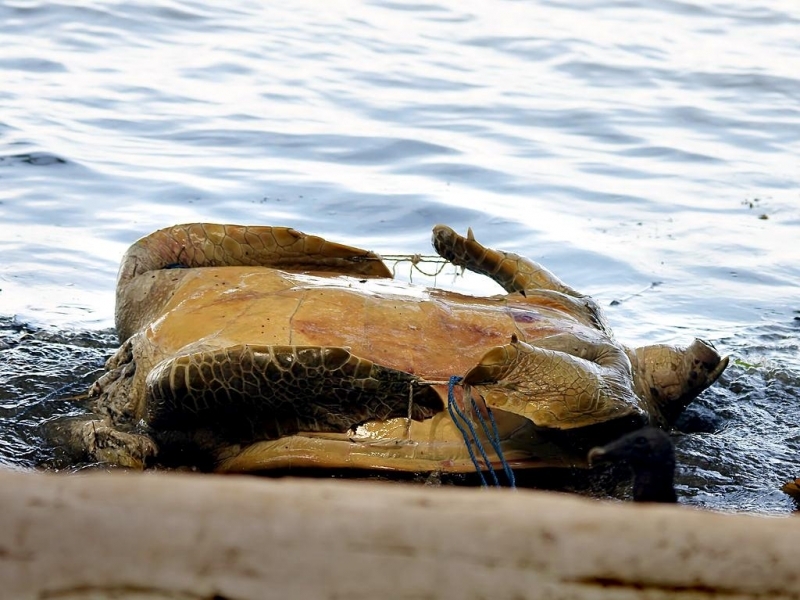 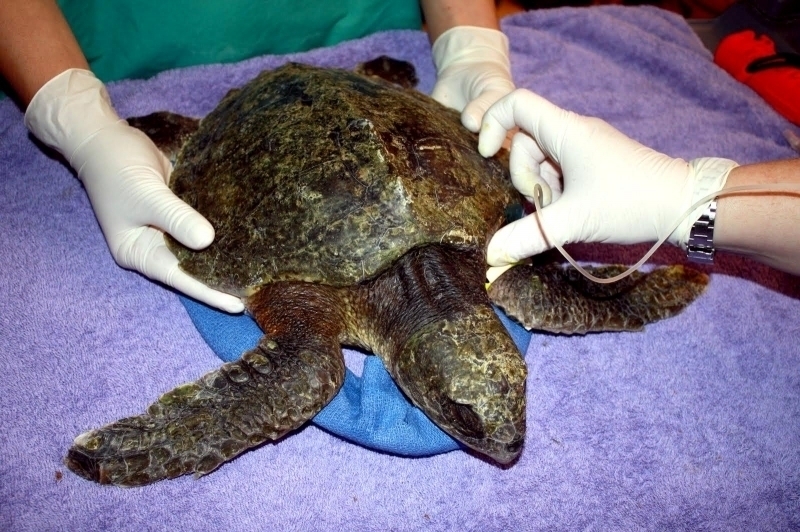 Although sea turtles move swiftly in the ocean, they are slow & defenseless on land. 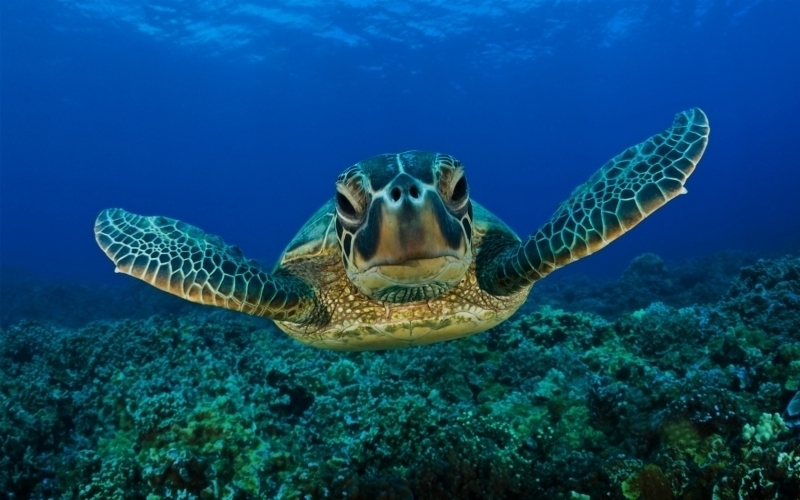 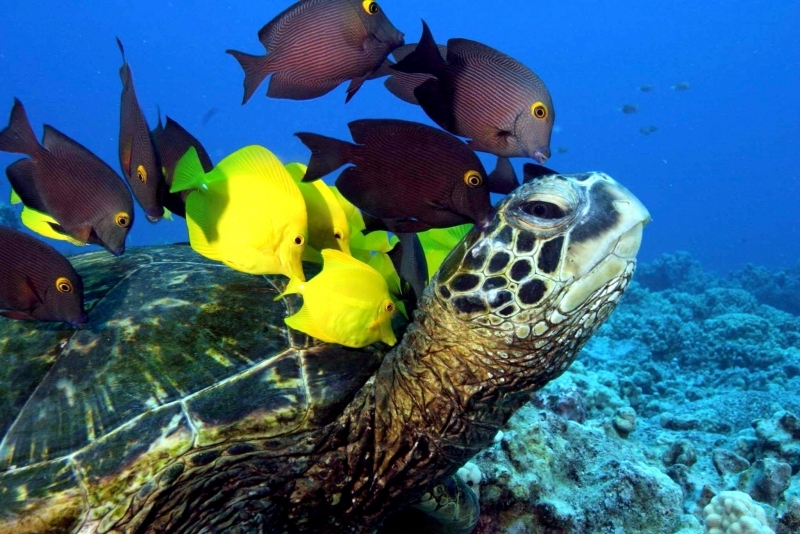 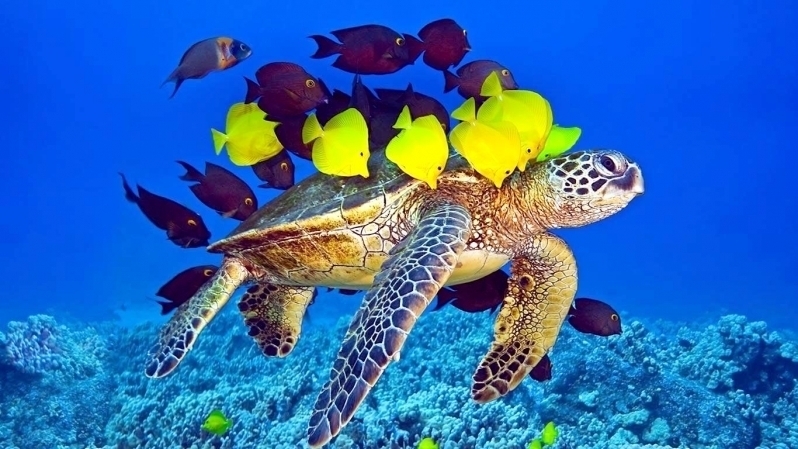 Male Green Sea Turtles almost never leave the water. 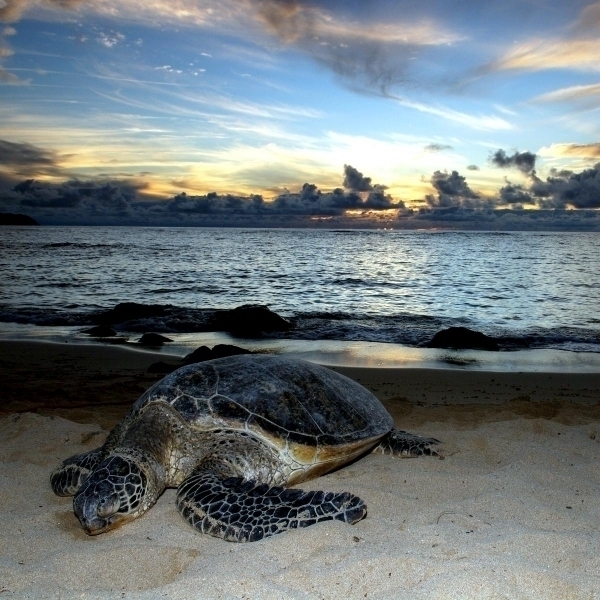 Female Green Sea Turtles leave the ocean only to lay eggs and for most species, nest only at night. 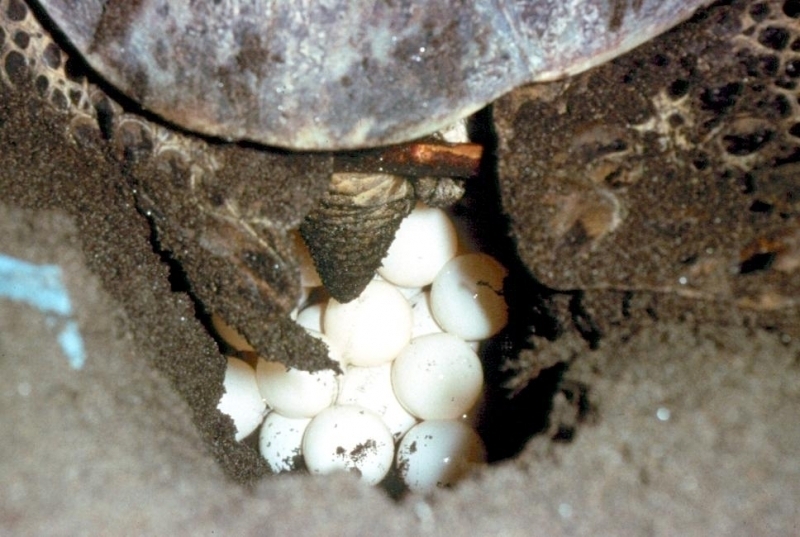 A female may nest every 2-3 years. 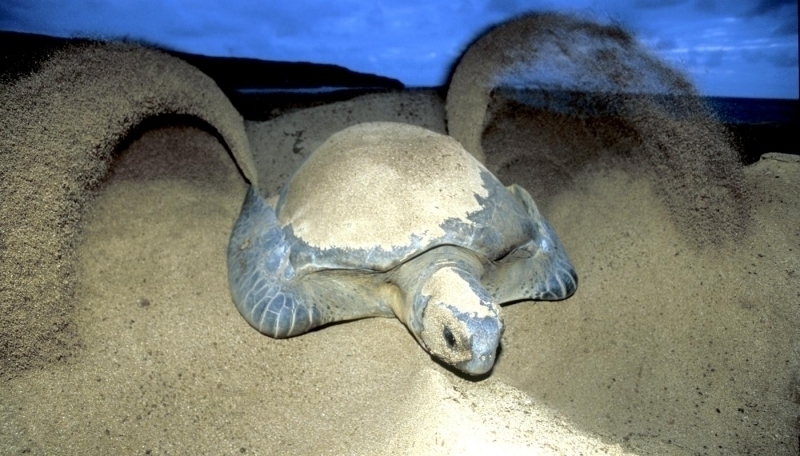 Nesting can take between 1-3 hours. 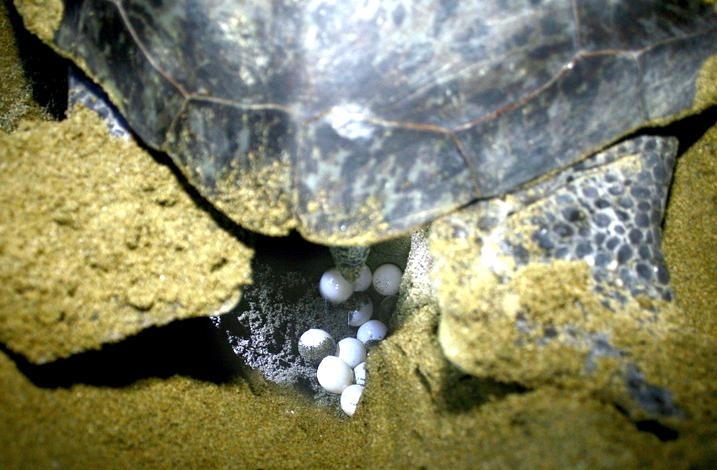 After a female turtle drags herself up the beach, she hollows out a pit with her back legs and deposits from 50 to 200 eggs. 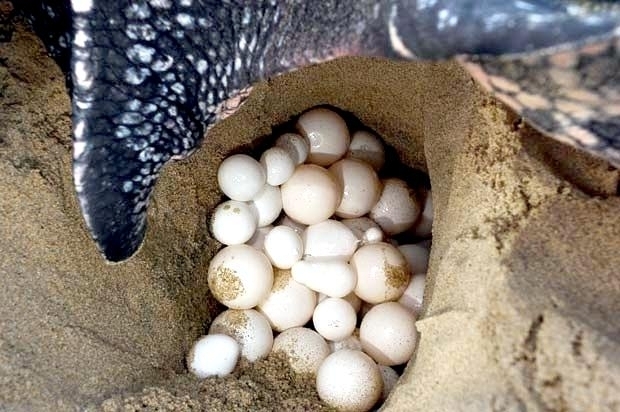 When the last egg is laid, the turtle covers the eggs with sand, tamps down the sand with her plastron and flings more sand about with her flippers to erase any signs of the nest. 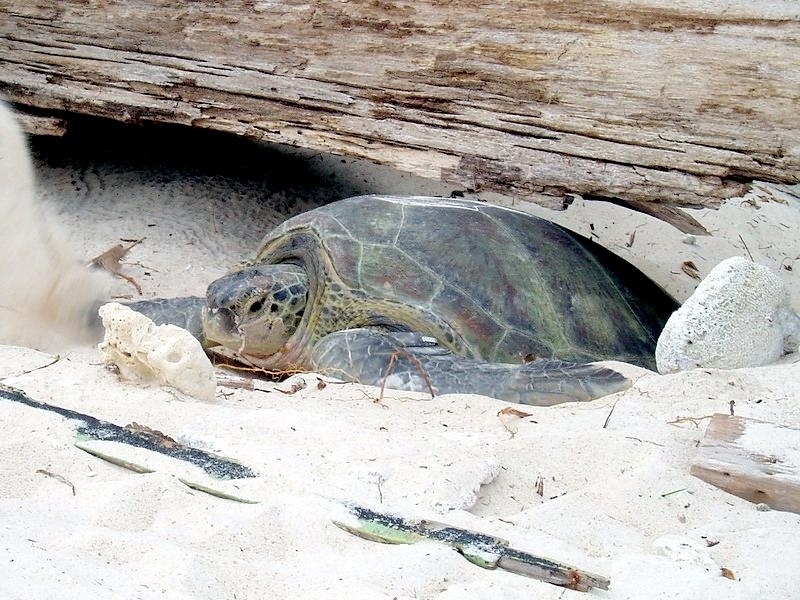 The Green Sea Turtle has also been observed often digging another “decoy” nest next to the real one to deceive predators and keep their eggs safe. 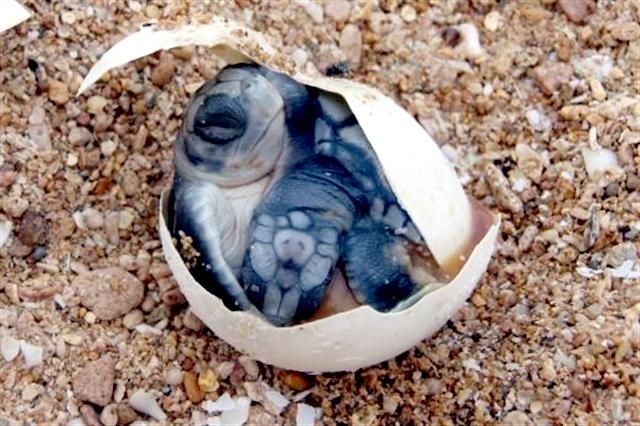 After about 2 months, the hatchlings emerge at night. 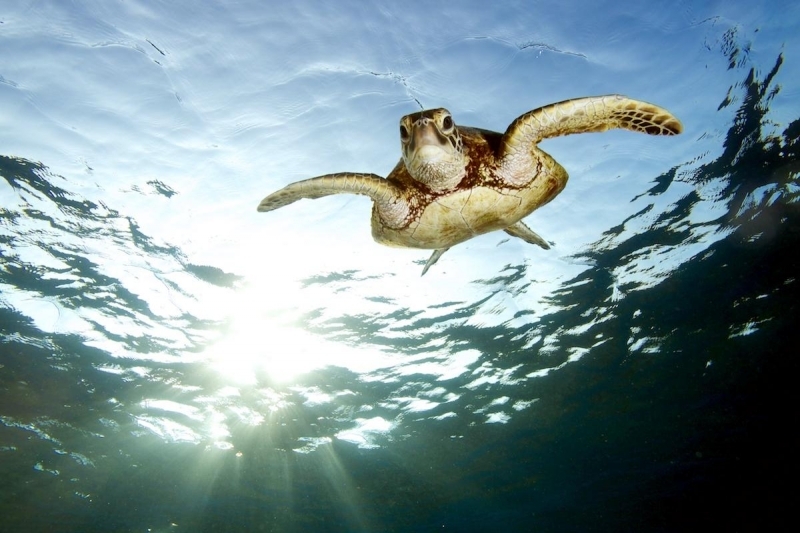 The light reflected off the water from the sky guides them to the sea. 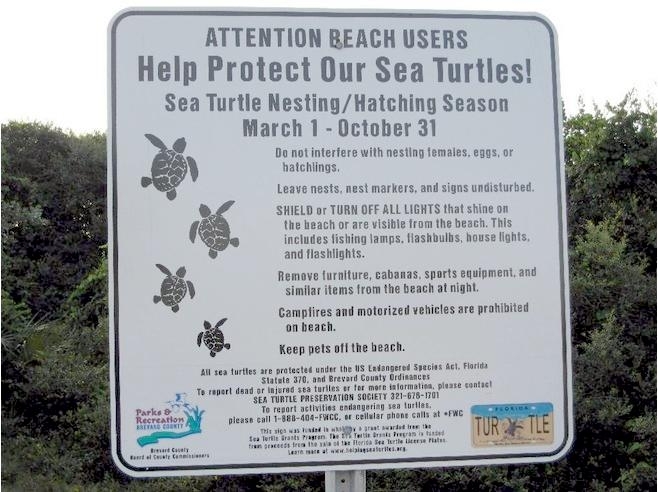 These days, car headlights, street lamps or lights on buildings near the beach cause some hatchlings to travel in the wrong direction. 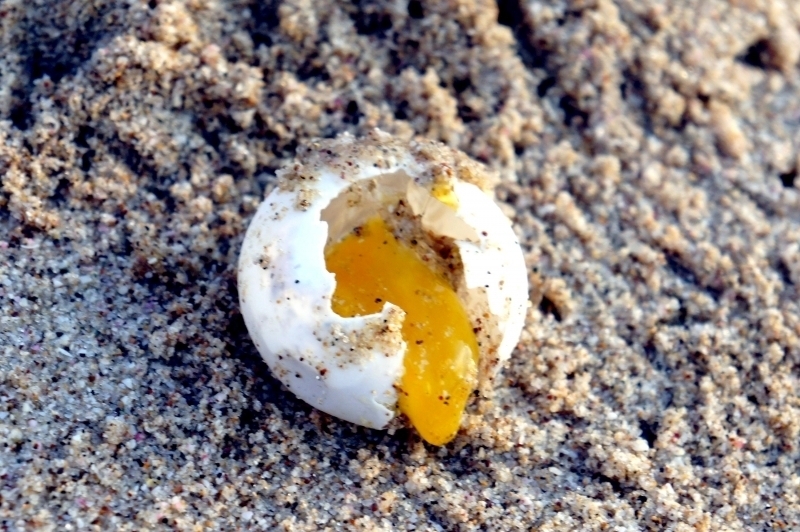 Waiting herons make fast meals of other hatchlings. 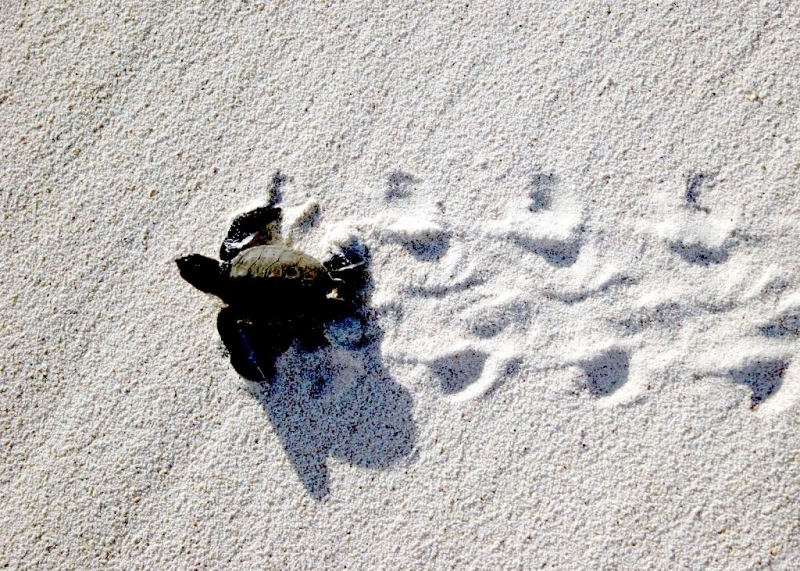 Any Green Sea Turtle babies still on the beach in the morning, are easily picked off by predators or die in the hot sun. 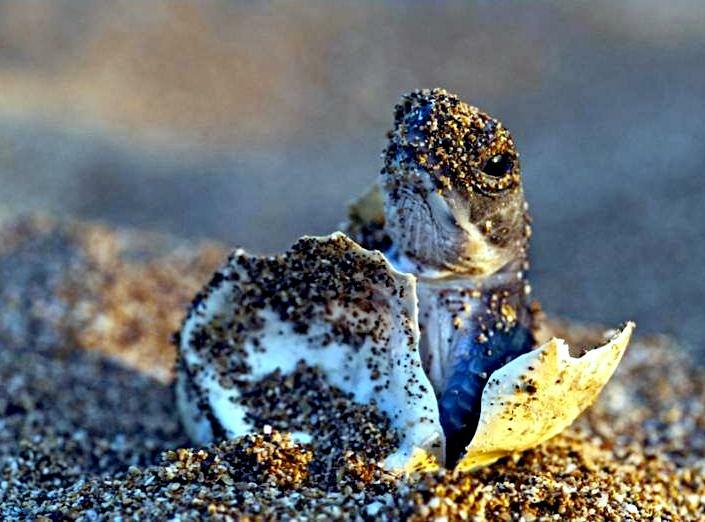 It is thought that when the surviving hatchlings reach maturity, they return to the beach where they hatched to lay their eggs. 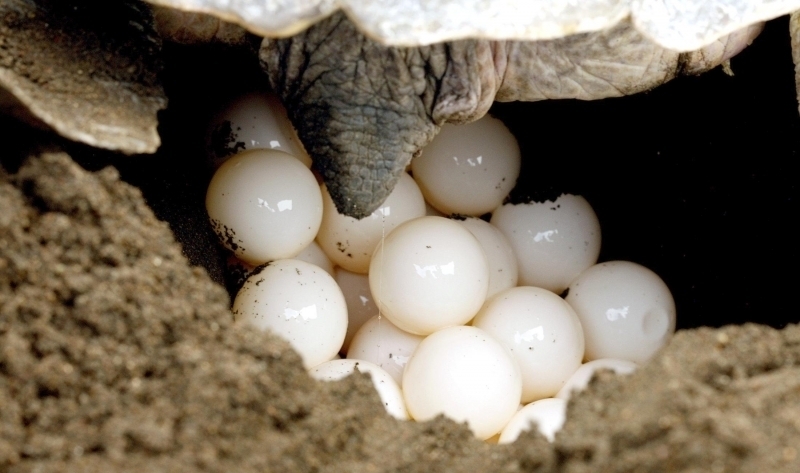 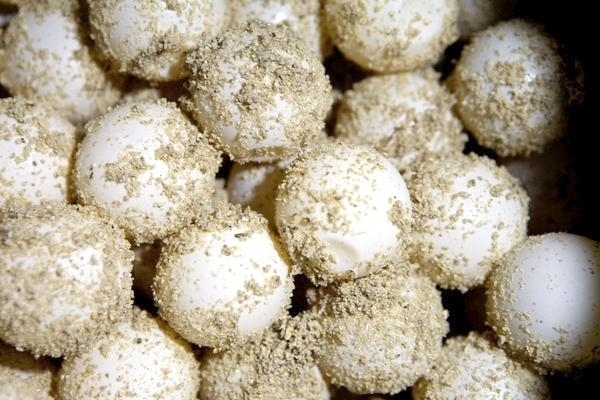 The female lays 70-130 eggs, each one about the size of a ping-pong ball. 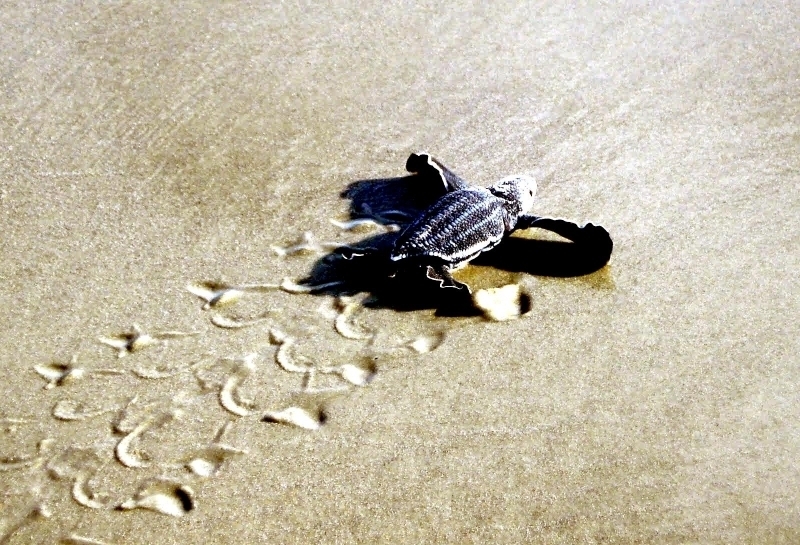 About 2 months later, the eggs hatch and the young turtles head straight for sea. 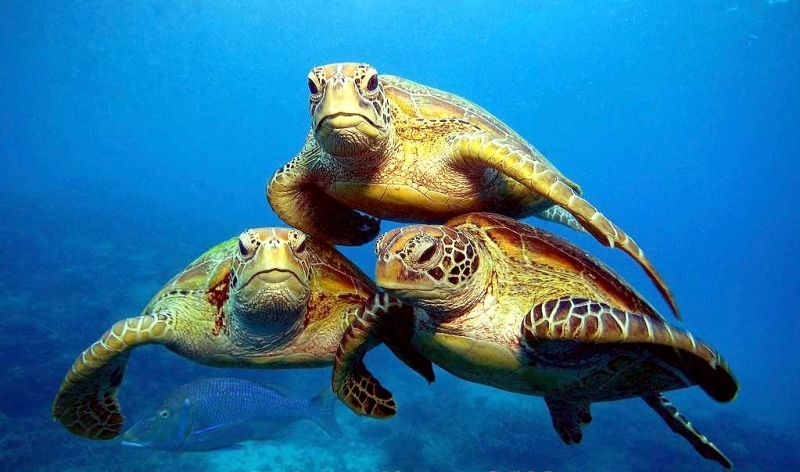 Somehow they know that they must live in the water and not on land. 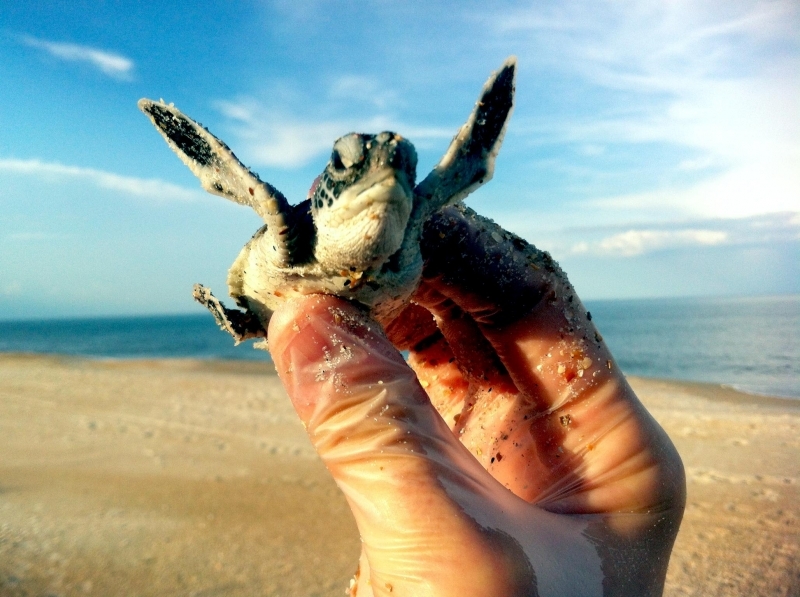 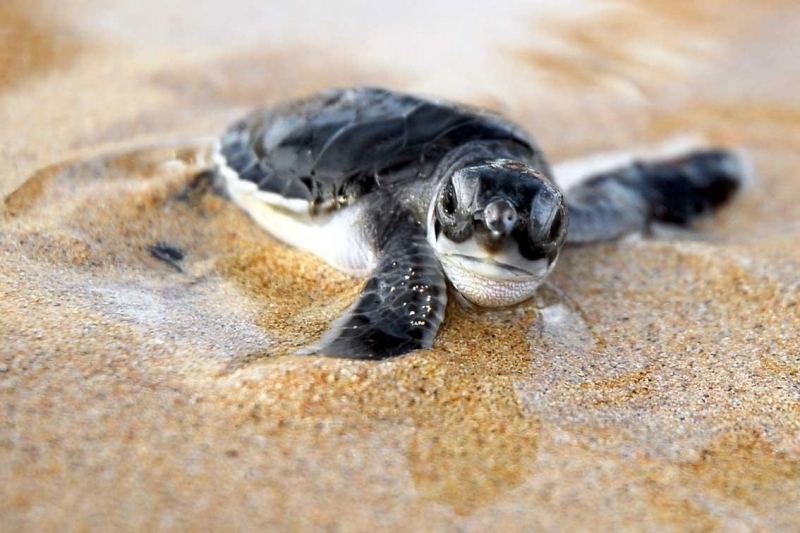 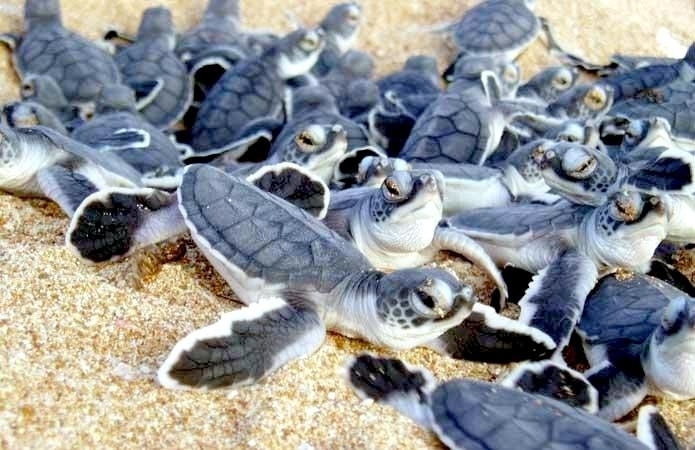 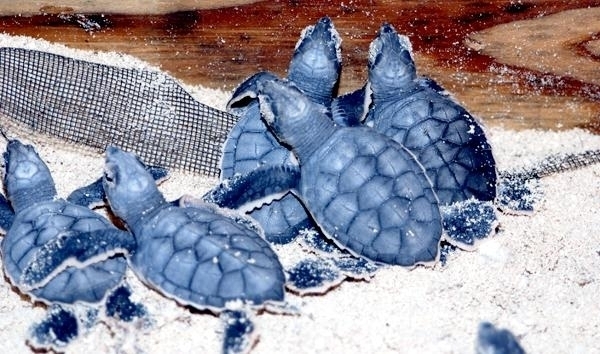 Baby Green Sea Turtles weigh about 1 ounce and are about 5 centimeters long.